The Antioch Mission in Asia is an Independent Catholic and progressive conscious minded community in North Borneo, (Sabah, Malaysia), a mission province under the tutelage of the Australian Church of Antioch. "We value humanity and respect life as God's precious manifestation. We uphold the core message of Christ that is to Love unconditionally. We understand that being human means being spiritual; Living life to the fullest means becoming more human because the essential form of humanity itself is spiritual." The cross or known as the "Cross of Antioch" is a significant symbol of Patriarch Herman Spruit and his predecessor Bishop Lowell Paul Wadle. Bishop Carrey had a great affection with this cross and felt connection with the historical significant of the cross. Rather than using the standard Latin or Greek, he opt to use the Cross of Antioch. The mitre and crozier that accompany the Cross of Antioch symbolizes the strong history of his predecessors and apostolic successions. He is always reminded to follow the good examples of his predecessors and honored the historical successions. He regard the episcopal blessings that he had as the merits of his predecessors and it is important for him to follow their diligent examples. The yellow color on the shield represents wisdom as the highest goal in all the field his ministry. The dove in rainbow wings represents peace and diversity in the Bishop's ministry. It is important that his work is the ministry of peace; first to himself, then to his fellow friends in ministry and then to the people regardless of who they are and where they are on their spiritual journey. On the next side of the yellow shield is the native musical instruments of Sabah (North Borneo), which is the Gong and the Sompoton (wind bamboo instrument). It symbolizes the musical background of Bishop Carrey as an indigenous native of the KadazanDusun in Sabah. On the lower part of the yellow shield is the symbol of Eucharist and wheat, showing the passion of Bishop Carrey's ministry in the sacrament. In Antioch, everyone with good intention to receive the love of God are welcome to receive the Holy Communion. Therefore the theological approach of the Australian Church of Antioch towards the administration of the Divine Grace supports Bishop Carrey's universal understanding of the "priesthood for all people". Like his predecessors, the Eucharist is mystically seen as carrying the heavenly energies that is always ready to be shared to the people so that it will benefit the person's emotion, consciousness, and higher experiences, where many possibilities dwells. 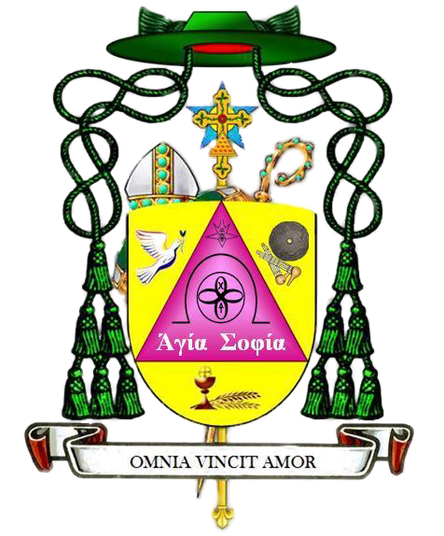 The fuchsia triangle at the centre of the shield represents the Holy Trinity that is the Power (Creator Parent), Love (The Son), and the Divine Wisdom (Holy Spirit). The triangle also symbolizes the Fire element related to Bishop Carrey's spirituality, which is also the symbolical event of the tongue of fire during the apostolic Pentecost, which is seen as the spiritual manifestation of those who follow the mystic path of Christ. The large symbol in the centre of the triangle represents The Sophia that is the divine inspiration and wisdom that guides Bishop Carrey's spiritual journey towards the union with God. The Greek transcription "Ἁγία Σοφία" (pronounced Hagia Sophia) means the Holy Wisdom. He believes that by divine inspiration human finds peace, bliss and unlimited creativity. That is why for Bishop Carrey's ministry, the pursue of wisdom is the most important call before any decision to do anything in life. On top of The Sophia symbol is the official emblem of the Australian Church of Antioch which is placed higher near the peak of the triangle to remind Bishop Carrey of his apostolic origins, where he is bestowed the responsibility to carry the many apostolic lineages and to continue his predecessors' (+++Frank, +++Spruit, +++Vilatte) legacies. The color fuchsia with the emanation of pink color from the centre of the triangle represents collaboration (fuchsia) and love (pink) as Bishop Carrey's core values in his ministry. It shows his passion for interfaith relations, ecumenical communion and comparative studies of religions. Through these passions, Bishop Carrey wishes to share the grace of sacraments and its power to ALL people with his well-known affirmation that "God is Love and Love is the human's essence". With that, it is no doubt that his Coat of Arms' motto speaks loudly of his passions. The Latin word 'Omnia Vincit Amor' means "love conquers all". He said that love is what makes the world go round, whether for better or for worst but a divine or genuine love is simple and it does not require theology or dogma; only the willingness to experience peace, joy, kindness, and forgiveness at the present state.